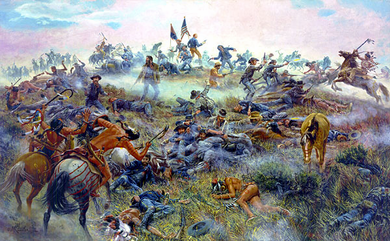 Mort Kunstler Handsigned and Numbered Limited Edition Giclee on Canvas:"Custer's Last Stand"
About the Art: During the winter of 1875-76, the Indian Bureau and the U.S. Army, acting as arms of the government, ordered all Plains tribes to go into assigned reservations. Under the leadership of Sitting Bull, Crazy Horse, and others, thousands of Sioux, Cheyennes, and Arapahos gathered along the Little Bighorn, determined to remain free of government control. It was here that Custer found them on June 25, 1876, and fought a battle now known around the world.